A chance encounter and a small act of kindness reverberate in the lives of three women to transformative effect in Marie Jones’ gentle, reflective, movingly humane Dear Arabella. The Belfast playwright’s signature relish for vernacular humour is here but noticeably more restrained in a trio of crafted monologues that play with time and place, heart and hope with consummate ease. There’s something touching and intimate, simple and profound in Jones’ compassionate dissection of lives thrown glancingly but fatefully together that suggests a new maturity for the Olivier-winning writer of Stones in His Pockets. She’s blessed by three adroitly controlled performances brimming with stunted aspirations and aching regret that unpick the sorry lot of women in a post-war, pre-Troubles, male dominated Northern Ireland. Nursing an ageing mother and straining for the light in her sun-deprived east-Belfast street, Katie Tumelty’s quietly bristling Jean flees to the seaside. 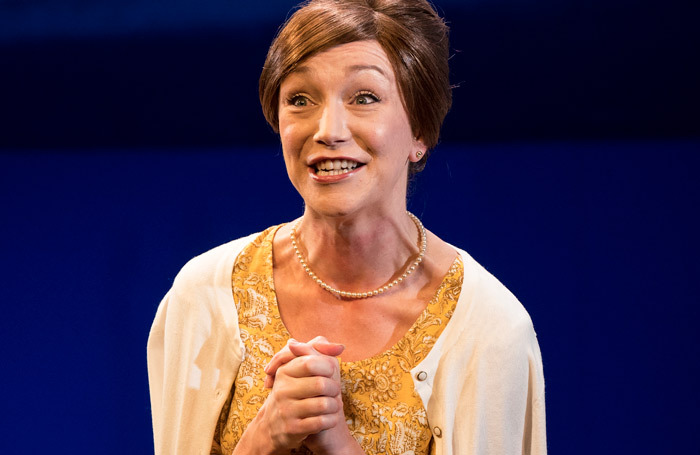 En route she encounters Elsie (a performance of graceful, compassionate warmth by Laura Hughes) long-suffering wife of war-amputee Cecil, whose ailing cat is the least of her worries. Silently on stage for an hour before her first line, Lucia McAnespie’s Arabella, mourning the war-time loss of her husband, can be excused a few fluffs in an otherwise delicately nuanced performance that unlocks the intricate interweaving of Jones’ kaleidoscopic but involving text. Lindsay Posner’s deftly understated direction and Peter McKintosh’s elegantly discrete set – a projected seascape subtly segueing through shifting tones and temperatures behind a chair on a parquet-floored platform – allow moment and memory to flow poignantly together in a thoughtful and touching evening.